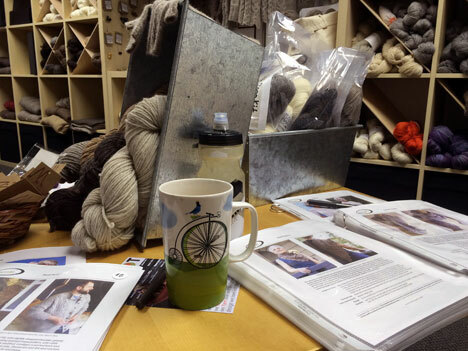 the last few weeks have been a bit of a whirlwind as our little shop participated in a regional yarn crawl. usually not the epicenter of activity, suddenly we had all sorts of new faces crossing our threshold—fiber enthusiasts who traveled to us as part of the tour. it was absolutely wonderful to meet and talk to so many knitters and crocheters and introduce them to our yarns and designs. many had never heard of us before; quite a few do not use the internet or even a computer and yet we had plenty of common ground to share around yarn love, haha. oooh, speaking of yarn love, the winner of the carol feller book giveaway is andrea m. she has been emailed and her prize is on the way. thank you all for participating in carol’s book release; authors work so hard in secret for so long, it’s a real treat to finally celebrate with us all. september is harvest month and tomatoes wait for no yarn crawlers—we spent many late nights this month taking advantage of our garden’s productivity to get food stored away for winter. 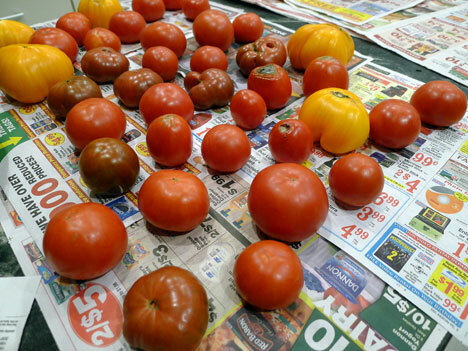 one night i put up so many tomatoes that i ran out of containers and we had to scramble to make do. i had enough yellow tomatoes this year to do a separate batch of yellow puree. i don’t know what i’ll use it for but it will make a surprisingly vivid sauce for a special occasion. 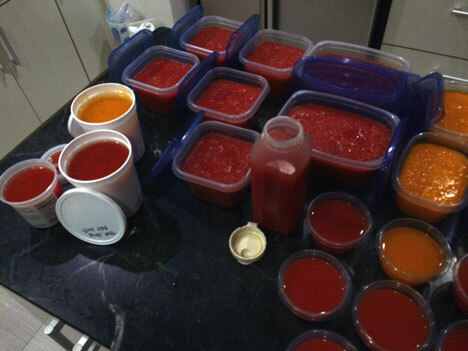 i’m even freezing tomato juice—a personal favorite; i don’t know why i never did it before. 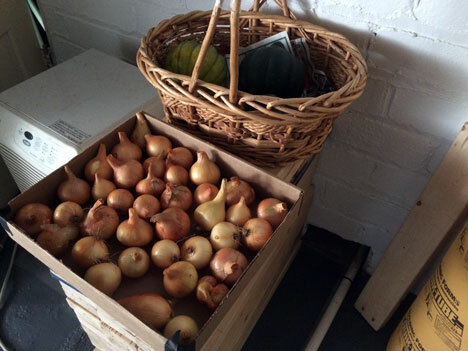 the onions i pulled while david was away have been brushed clean and trimmed; they are stored in the basement with the winter squashes. the squash plants have mostly died back, but i’m still picking pounds of green beans each week as well as eggplant, peppers, and lots of greens. everything tastes wonderful; we barely buy anything at the store when we shop. the next harvest will probably be potatoes, leeks, and celeriac, the last root vegetables that i have in the ground. the salad patch i planted does have some beets tho, so maybe a few of those as well. i feel so lucky this year; we are rich. 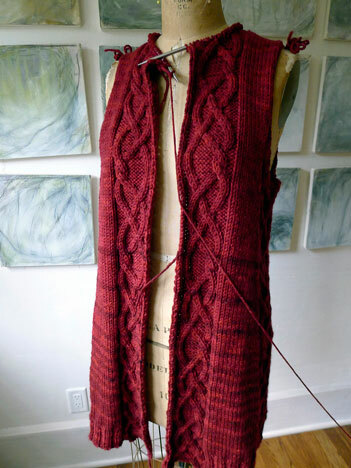 and despite all that was going on, i brewed up a bit of a knitting storm last week, which escalated considerably between wednesday and sunday—that’s why you haven’t seen me around here at all (sorry!!). but i think you’ll be happy with my investment. in fact, i actually took two days—thursday and sunday—completely off from the computer so i could focus on knitting alone. and the big cabled blob benefitted greatly from that concentrated effort. i alternated skeins through the hem and lower body of my project because one of my skeins was darker, having been dyed in a separate batch. mmm, soft pretzel cables . . . deee-licious in spirit trail vesta, which will be a jen’s new offering at rhinebeck this year (get some at the spirit trail booth in building A). the knitting just flies along when working with chunky weight yarn and as my piece grew, i became even more motivated to finish ASAP. 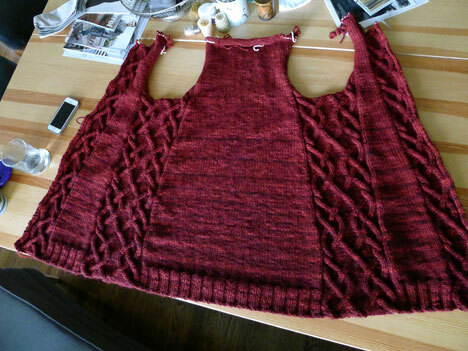 by saturday morning my big body piece was off the needles and ready for finishing. after attending to some other things during the day, i fired up the iron after dinner and blocked both this piece and the sleeves. 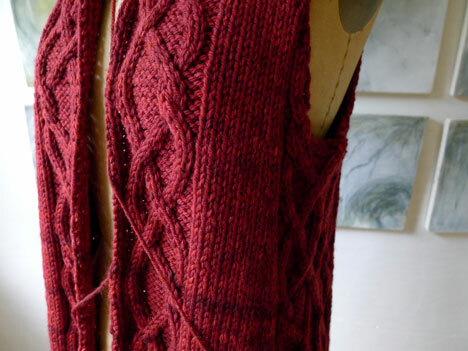 that night i began the process of finishing—stitching the shoulder seams, picking up the stitches for the collar, and getting a jump on knitting that before i finally passed out. when i woke up, i put the shell on my dress form; it was so exciting to finally see what i had. the armhole depth was a little too long and needed to be adjusted, but aside from that, it was looking good. phew! 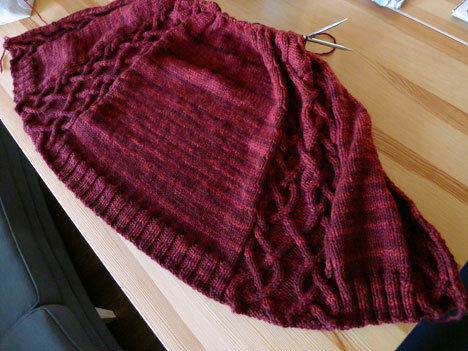 there is a shorter, hip-length version as well, which barb is knitting. i got so many positive comments about pockets on the the pedal pusher sweater that i’m thinking this coat could even have some cool cabled ones added at the sides; what do you think? somewhere in those few days, the buttons arrived from moving mud—at jen’s request, i sent a swatch to sarina and as usual, she created the perfect accent for the front of the coat. i thought the flat style would be best for my purposes, but by all means, round ones would work equally well. yeah, man . . . they are like little slices of exotic fruit, aren’t they? and they are just the right accent for the front of this coat—strong enough to stand up to the oversized cable with their stunning gray-green edges. buttoned all the way up, the coat sports its own slouchy cowl to use as a wind barrier. personally, i just love the wide, delicious collar unbuttoned enough to spread out over my shoulders in a pleasingly crumpled heap. 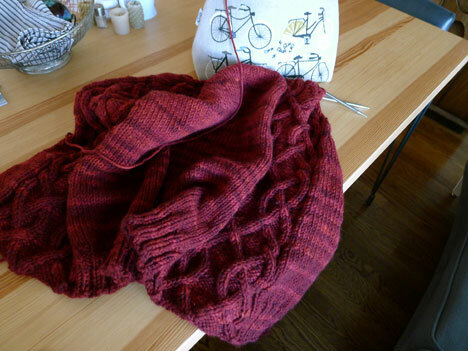 it will accommodate a little nothing scarf inside to add an extra layer of texture and warmth. 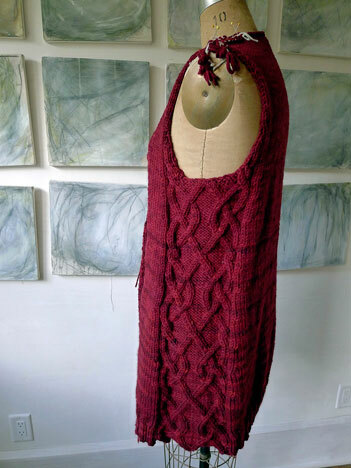 the pattern for this garment (which includes instructions for a jacket length version) will be released along with the vesta rollout over rhinebeck weekend (october 17th and 18th). it’s in production now and will be ready for purchase both here and in the spirit trail booth—keep your eye out for it. 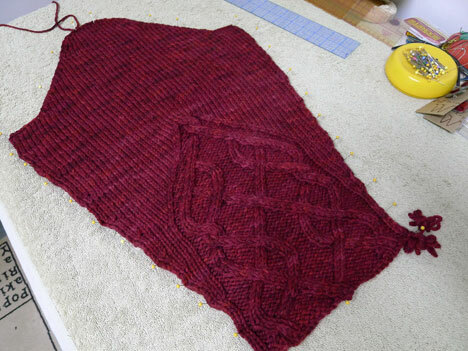 we are knitting one in chebris worsted as we speak—the frappé shade. mmm, won’t that be a treat? i cannot wait to sink myself into that one, yum yum. and speaking of chebris worsted, now that the cooler weather has arrive, i can fully indulge the itchy fingers i’ve had for this yarn all summer long. i have been dying to start something and now i have; care to guess what it might be? OMG, that sweater coat is divine! How do you do it! Congratulations on another winning design Anne. Wow! That looks amazing! You have beven knitting like the wind! Can’t wait for the release. I always enjoy your garden posts – the orange puree looks scrumptious! I’ve never had much luck with onions; neglect, I suppose. The new sweater design is lovely! I’m a big fan of cables. 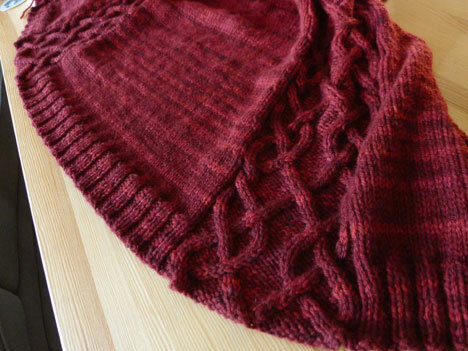 And I’m glad to see a version being worked up in worsted – my stash has a ton of worsted. The red is stunning. That is just an amazing sweater! I love the option of the longer length. the sweater coat is beautiful. Vesta is now on my ever growing Rhinebeck shopping list. That sweater is gorgeous, Anne. I cannot wait until it is released. Looking forward to Rhinebeck even more now! Ok, now I can’t wait for the sweater coat pattern! I bet it could do all winter for me; I don’t like a heavy coat anyway, and when I’m walking I get pretty warm anyway. It’s really luscious in that color, too– bet it feels good! 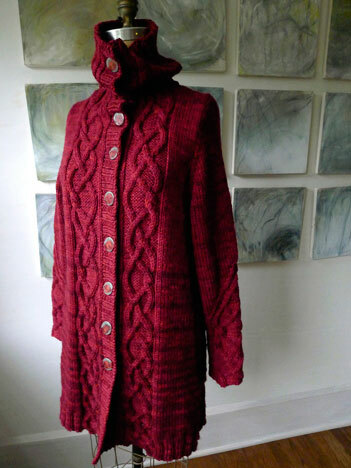 Your garden is such an inspiration….and the new sweater coat is a design that I would love to knit! That red! But really I want to know how you store your leeks. I have a bumper crop this year and I’m looking at options! 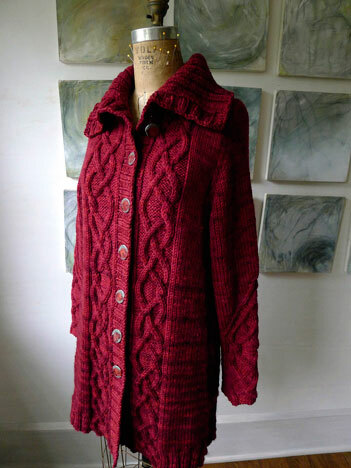 Love everything about this sweater/coat – cables, long length, red yarn and the buttons, oh my! No joke, I was searching Rav today and yesterday for worsted-weight jackets or cardigans with cables and pockets. Love this design, but would absolutely love to see it with pockets. Although, I have a personal preference for pockets that aren’t too bulky – not quite sure what you mean by ‘cable pockets’. Gorgeous coat, Anne! The design, color, buttons–a perfect storm! Wow that coat is AMAZING. 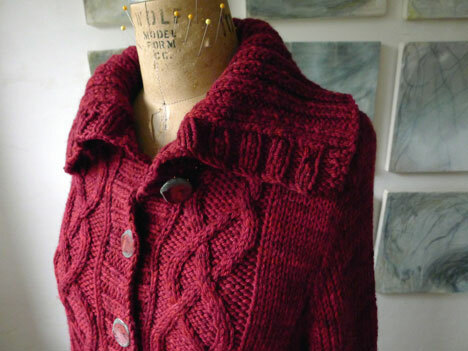 Love the color and the cables and the big snuggly collar and the gorgeous buttons…everything! Can’t wait for the pattern to be released! 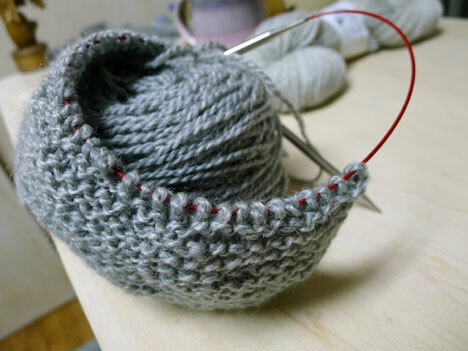 You are the Energizer Bunny of knitting. Hosting people on the yarn crawl, putting up all the goodness from your garden, and completing a delicious cabled sweater coat. Shssss…I think I’ll go take a nap. OMG this coat… so ridiculously amazing, I’m in love!!! I want one! WOW, Anne! I’ve hoped for years that you would design a long coat-y sweater, and this one is sublime. Just gorgeous. Wow! Fabulous sweater/coat. Love the cabling and the color is so yummy. I am a pocket lover, so that would be a nice option. This will move up to next on my list after I finish my Triticum. Love the sweater, Anne! Gorgeous! BTW–where did you get that great cup? 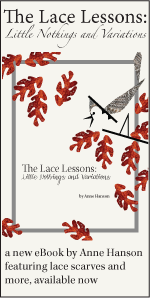 Anne, this is incredibly beautiful. The color, the buttons, the cables! Perfection! Oh, how I wish I was going to Rhinebeck. Gorgeous – looks so scrumptious and cozy! I love the cowl neck. Another winner from Anne! WOW!! OMG, Anne, I LOVE the sweater design!! Happy Happy Happy Dance; can’t wait to show it off at Rhinebeck. And I’m glad I dyed extra of this color. It looks absolutely fantastic! Big Hugs! (yes, lots of exclamation points because I AM REALLY EXCITED!!!!! 😀 ). Anne, your sweater is divine! The color is gorgeous. I love everything about it. Everything. Yet another sweater I must have! You are pure genius. OMG that coat is divine!! I love the side view photo showing that stunning cabled panel. Those buttons are perfect. Ooh, even more gorgeous than I suspected (and add my vote to the pockets column…i love me some pockets)! Jennifer’s red color is divine! The sweater-coat is a winner, and stunning in that shade of red. Not to mention the striking buttons! Make pockets an option, and all will be perfect. OMG! That is a beautiful coat! I want it in a big way! Thanks for the wonderful post and catch up. 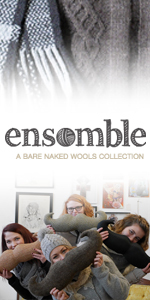 Glad to hear that others are discovering your yarns and shop. Oh my. The sweater-coat is divine. It is just gorgeous! OMG! This turned out so beautifully! WANT! Fabulous buttons!!! Perfect touch to a beautiful coat. Anne, your coat is absolutely stunning from the color to the weight to the cables. When I think you have designed your best yet, you come up with another best yet! The coat is beautiful. Let me know when the pattern is available.